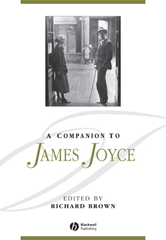 A Companion to James Joyce offers a unique composite overview and analysis of Joyce's writing, his global image, and his growing impact on twentieth- and twenty-first-century literatures. Brings together newly-commissioned essays by some of the top scholars in the field. Explores Joyce's distinctive cultural place in Irish, British and European modernism and the growing impact of his work elsewhere in the world. A comprehensive and timely Companion to current debates and possible areas of future development in Joyce studies. Offers new critical readings of several of Joyce's works, including Dubliners, A Portrait of the Artist as a Young Man, and Ulysses.